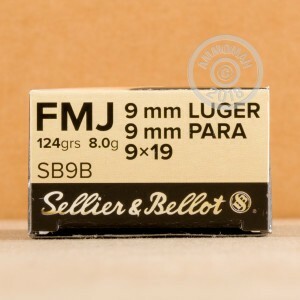 This 9mm Luger ammunition from Sellier & Bellot is a popular choice for the range among many CCW holders thanks to its excellent combination of low cost and reliable, accurate performance. Each cartridge in this volume priced case of 1,000 fires a medium weight 124 grain full metal jacket bullet at a muzzle velocity of 1,181 feet per second. This makes it a slightly more powerful than average load for the 9mm Parabellum; the increased recoil results in more realistic target practice. 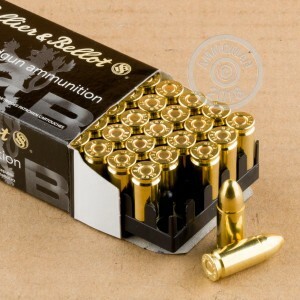 Sellier & Bellot ammo is made in the Czech Republic using non-corrosive Boxer primers and reloadable brass cases. Place an order for $99 or more at AmmoMan.com (including large cases like this one) and enjoy free shipping! I have purchased S&B 124 grain ammo multiple times. I shoot several different brands of 9mm. Never had one issue with the ammo. Ammoman makes ordering so very easy. I usually have my order within 48 hours or less. 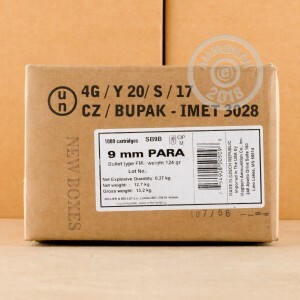 This will be my 3rd time ordering this brand/weight of ammo. I haven't had a problem with any of my guns firing this product. It is also a clean firing ammo. I clean all of my guns after firing. This brand does not leave a lot of gunpowder residue in my guns. I highly recommend this product.